My friend in the Jesup Shrine Club recently purchased a convertible Shriner Corvair. It is a 66 Monza 110 PG. It was on a Florida Craigs List recently. It is a running car. He has got a little rocker rust to take care of. He says it starts up quick and runs fine. He has no other Vairs. This the second one I came to know about since October. I saw one in Maggie Valley at the Vairs in Valley function. That one was a 140 PG convertible. Edited 1 time(s). Last edit at 04/11/2019 07:28PM by Lane66m. This the one in Jesup GA. Ohio winters were not kind to it. It must have been left outside and run on salted roads. But the new owners intentions is to bring it back to the way it look with its Shriners paintjob and other artifacts. It will then be put in the local area parades. He is a Shriner like myself. I will start making a care box of things I find he can use that I have no use for with my 2 Monzas. At least some of the scrapped car parts I saved might have a home other than the trash bin or the recycle yard. Already the red interior panels will get a home along with a front license plate bracket. Al could you please share some historical info on these Shriner Cars? I have seen them before, but do not know a whole lot about them. The little I (think I) know, is that . . . .
#1. There was about a dozen of them at one time. #2. They were painted up like this to be used for Shrine events and parades. #3. They were done up in this Patriotic Paint scheme at the time of, and in honor of, the Bi-centennial Celebration of our Awesome Country. Is any of this accurate? Or just Urban Legend and Myth? Not a myth. There was a dozen painted up the same. 65 & 66 Vairs. Belonging to Nobles of the Zenobia Shrine in Ohio back in the 70s. 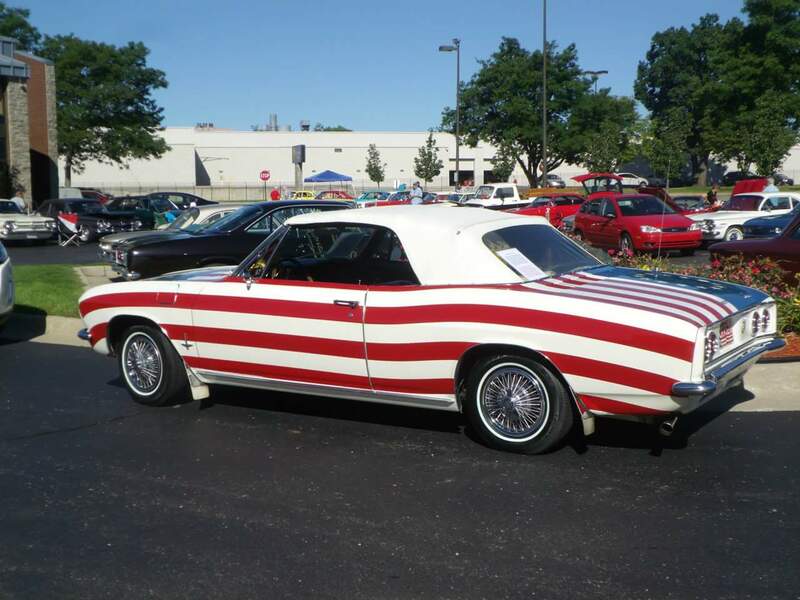 They even still talk about the flag painted Corvair on their website, but no photos. Edited 1 time(s). Last edit at 04/17/2019 07:52PM by Lane66m. There was a brief discussion 10 years ago also. Search is your friend. 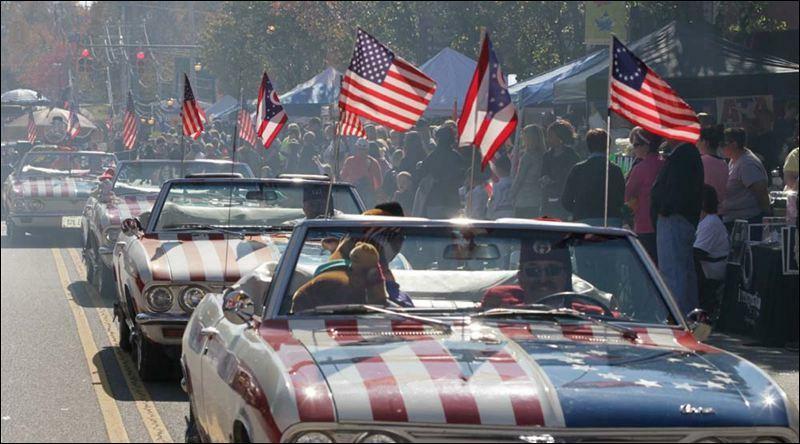 Dan's car is now owned by a past Grand Potentate of Shrine in Ohio, and a member of Friends of Corvair club. So it's truly in good hands where it belongs. Member's name is Gary DeMoss. I've told him already that he's having way too much fun with it. Glad another one will be saved. At least one that I know of rotted away. The cars themselves were usually nothing special, whatever the member could find for sale at the time. But having fun is what the Shriners love to do, in addition to supporting their children's hospitals. Yes but they were all convertibles, so that makes them at least Monzas or Corsas. No coupes, no sport sedans, no 500's. ALL the ones I saw from the Toledo, Ohio group were Corsas. I saw that in OH as we were looking for a place to eat when I was coming back from a trip to a boat company in OH. At the time, I had remembered seeing it here, but couldn’t remember the significance of it. That’s been bothering me since, so thanks for clearing that up. One of them just went to Central Illinois. 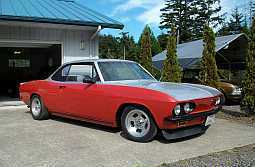 You should see it in the Corvair Museum soon! 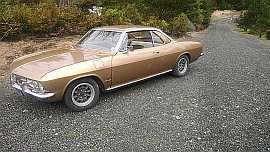 > should see it in the Corvair Museum soon! 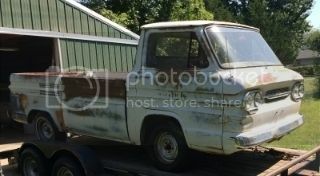 My middle daughter goes to school in Decatur, and I told her that when I pick her up to move her home for the summer I’m not leaving until I get to go to the Corvair museum! Yes, they were all convertibles, except for the one 'Brier they had. But no, some of the convertibles were Monzas. And some of the manual trans cars were converted to automatic trans, as that is much better to drive in a parade (which is what they did most of the time). They were a mix of years, models, interior colors, and equipment, whatever was on the market at the time, that they could buy for this purpose. So beyond them being LM convertibles, there was nothing special about them. And I've seen all of them. 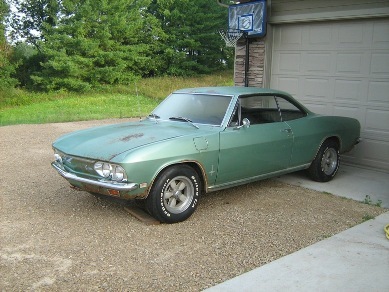 Just got a text that owner says Shriner Corvair is too much for him. He is looking to offload it. I know what he gave/traded, so I know car is not there in that value. I will need to find out what is going on and what he really wants for it. I learned his asking price. I will forward any contact info to the owner for anyone who PMs me their interest. Remember this is still a 66 Monza Convertible.